An eco-friendly and cheap cooling system developed by a Mexican researcher uses solar energy to maintain temperature of food and water at nine degrees Celsius for three months. Refrigerating systems have been under the spot light ever since they were found guilty of polluting the atmosphere with the Chlorofluorocarbons (CFCs), causing a depletion in the ozone layer. As of the 1970s, the negative effect of these compounds has globally acknowledged and heavily regulated. Nevertheless, their use in refrigerating systems continues to be apparent, and it will remain so until year 2020 (2030 for developing countries), when all CFCs should be faced out, as agreed during a United Nations-sponsored Montreal summit . It is somewhat needless to say that any technology that can accelerate the process of complete elimination of these chemicals by providing an eco-friendly and affordable alternative, is more than welcome. 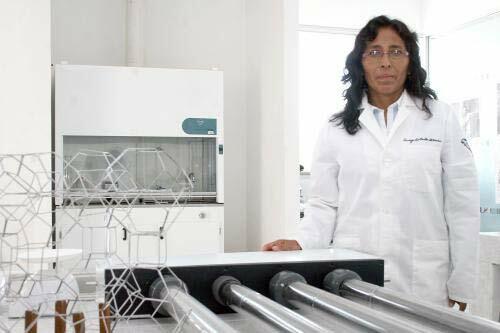 One such development comes from the Institute of Science of the Meritorious University of Puebla (BUAP), in Mexico, by researcher Susana Elvia Toledo Flores. A solar-powered, eco-friendly, cooling system. The cheap and easy to to produce technology has very few components- a solar collector, an adsorbent bed, a condenser and an evaporator. The system also uses only the mineral zeolite, water and methanol. It works by a thermodunamic adsorption-desportion cycle. It uses solar radiation, methanol (as a refrigerant) and the mineral zeolite (as an adsorbent). During the day, solar radiation heats up the zeolite, bringing up the vapor pressure of the methanol, which condenses the refrigerant. This is then stored in a tank, connected to the evaporator. At night, the temperature of the adsorbent bed decreases, so as the refrigerant pressure, causing the methanol to evaporate, while the adsorbent is cooling, maintaining the temperature of the confined environment. Flores has already developed a fully-functioning prototype, which was introduced to the public for a first time last month, during the International Congress of Solar Energy in Germany. It works continuously 24 hours a day, and can keep the temperature constant at nine degrees Celsius for up to three months. The next challenge in front of the researcher is to make the system cool down to five degrees. She believes that this cheap and eco-friendly technology will not only help communities, who have limited access to electricity, to preserve their food and medical supplies, but it could also act as an air-conditioner.